Carulli’s music generally speaks a simple but charming language. The Grand Duo Opus 86 for guitar and piano is a strong concert work and a valuable and substantial addition to the guitar repertoire. Although it requires a secure technique, it is suitable for players of moderate ability. This new edition is edited by the renowned Austrian guitarist Konrad Ragossnig. 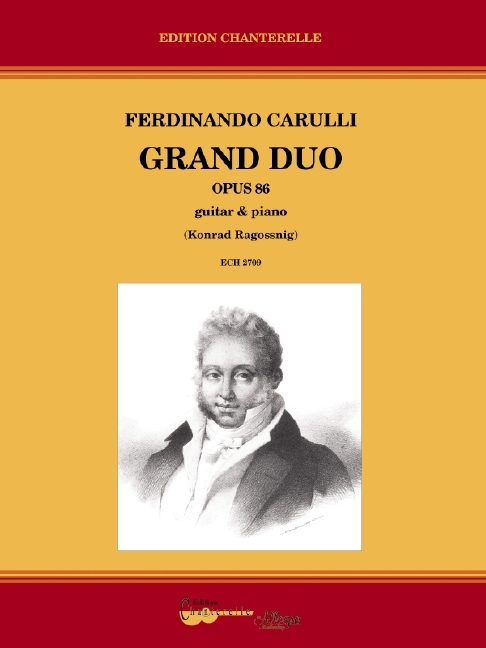 Ferdinando Carulli (1770 Naples – 1841 Paris) was self taught and established himself in Paris in 1813, where he enjoyed tremendous success both as a teacher and a concert soloist. He composed some 350 works, including many for duos and trios; his guitar method op. 241 is still in use today.